Before I begin the review, I should disclose that I’d purchased it myself, the second I saw it available on the eShop. I have a strong personal history with the series. The original Bloons game was released in 2007 amidst a Flash gaming renaissance, and its Tower Defence spinoff distilled the best mechanics out of a genre recently evolving out of Warcraft III Mods. 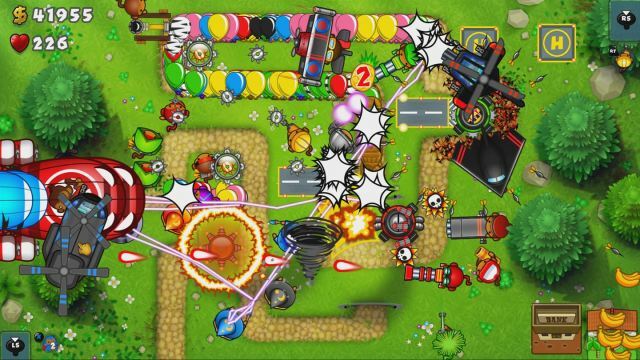 Bloons Tower Defence was streamlined and comedic – it did away with the big numbers, score counts and complex strategies that other bloated Tower Defence games at the time touted in the guise of good design. The developers, NinjaKiwi, made a lot of smart choices with the early games in the series, and I played them for hours. But NinjaKiwi meant something to me in addition to being irreverent Flash game developers – the studio in 2008 was two brothers fresh out of game-school in Auckland, New Zealand. They were representative of regular people who made it in the games industry, and it erased the barrier between developer and player. Their games made me see games as a kind of Field of Dreams, where if a game developer mixed enough talent, passion and creativity, players and revenue will surely follow. But if 2007 era Bloons was an idyllic pipe dream, Bloons TD 5 on the Switch is the nightmare. It’s a cultural artefact of a studio founded on the belief that making games for free was sustainable, who got inspired by the microtransaction-hell design philosophy in the social media era of the 2010’s, and are now releasing on the Switch because it offers free publicity to indies. It’s a poetic expression of a developer not dying a hero and instead living long enough to become a villain. The playful heart of the original game is still there, but it’s buried deep under some misguided belief that bigger is better, and that gamers are sheep with an insatiable hunger for content. 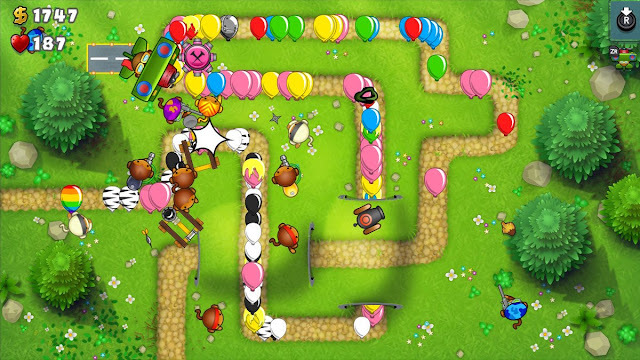 Bloons Tower Defence has always followed a simple formula – balloons trickle through the stage on a preset path, and it’s the player’s job to place towers (monkeys, in this case) who throw darts at them at strategic positions to defend each level’s exit point. Players can choose between different varieties of towers to best fit the needs of the level; whether they prefer longer range, area of effect or debuffs is up to them, but skillful choice and placement of towers are all the decisions the player has to make. There have been slight variations in the Bloons TD series, but overall the gameplay has been kept lean and elegant. So, with that out of the way, let’s take a quick journey of all the ways Bloons TD 5 messes it up. First of all, there’s an obnoxious experience/rank system which feels lifted out of Call of Duty’s Multiplayer mode. But while CoD implements that system to prevent new players from being paralysed for choice, and to entice players to keep their multiplayer servers going, Bloons TD 5 clearly just wants you to play the game for more hours than an average Tower Defence. They drip feed the various towers and upgrades to you based on how often you use each tower, and this is egregious because some towers have upgrades that change their strategic value to the player. For example, lead balloons can only be popped by explosive damage: these were introduced in the second game to force players to try the Bomb tower. 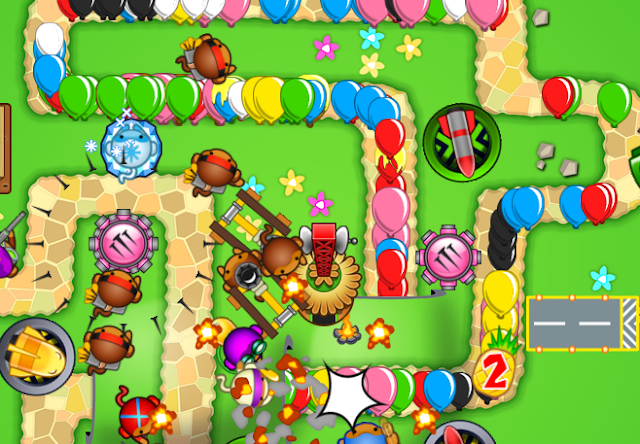 In Bloons TD 5, there are a multitude of towers that can deal explosive damage, but over half of them need upgrades that are locked behind some arbitrary rank requirement. 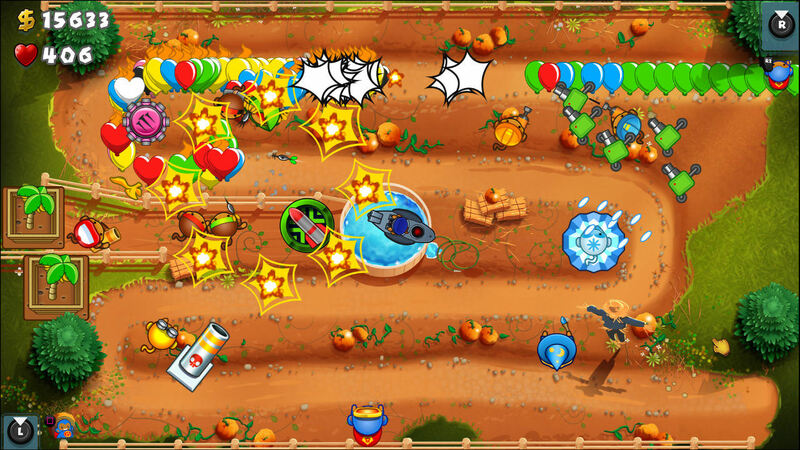 This game also has Camo bloons that require special upgrades, blimps that are hard to pop without certain upgrades – you’re missing the tools you need to beat the harder levels until you grind out the easy ones. On the note of the game wanting players to stick around for a long time, beating a level takes 30 minutes if you’re quick – keep that in mind. The game features a whopping 63 levels, each with 6 difficulty modes which don’t complete retroactively (if you win on Hard you won’t get medals for Easy and Medium) and another 260 special challenge levels which are just normal levels with various tower restrictions. There’s then another 28 weekly challenge levels which constantly refresh, but are again just reskins. There’s also a Mastery Mode, but I don’t know what it does since you need to have finished the first 17 levels 5 times each and have beaten the other 39 tracks at least once, and I blatantly refuse. Surely whatever the game considers to be “mastery” has to be a joke at the player’s expense: across all 63 levels, 5 difficulties and 260 special challenge levels, the levels are exactly the same. They might vary the path they take and how long the distance is between the spawn and the exit, but the number, composition and frequency of the 60 rounds which make up a level are constant no matter which game mode you play on. This also means that a combination of towers and upgrades which wins in one level is also good enough to win any other level. This isn’t even a strategy game anymore: as long as you have enough experience and avatar strength, the game plays itself. And this brings us to by far the game’s greatest evil: Monkey Money. Bloons TD 5 has two in-game currencies on top of the money you use to build towers, and these are a blight upon all the functioning systems in the game. Every mechanic leading up to this point has been trying to neg the player into dropping actual money into NinjaKiwi’s pocket. The Switch version isn’t a freemium game; rather it’s a port of a game which was. In the Switch version there is no ability to spend real money on Coins, which are redeemed for Monkey Money. Instead, you need to earn your Coins by beating levels, and you earn Monkey Money by completing arbitrary achievements like popping 1000 bloons with a certain tower or checking the Daily Rewards chest. Monkey Money (or M$ from now on) shows the player that the developers know the regular experience of their game is awful. You can use M$ to fast track your experience progression or unlock challenge modes without meeting their skill requirements. You can use M$ to buy persistent upgrades to your towers between levels, thus making the game easier. You can use M$ to skip the first 25 waves of a level and immediately earn the money you would’ve gotten for popping the slowest moving, least threatening, most timewasting bunch. I was worried that this might trivialise the game’s difficulty, but then I realised you can just spend M$ to buy more lives and get extra non-“premium” cash for towers in the game’s pause menu. Not only is the base game boring and unpalatable, the M$ mechanic actively tries to make you skip it, and then gives you the same medals as if you achieved something. I bought this game because I remembered the simple fun of Bloons TD 2 and wanted to have a copy on the go. 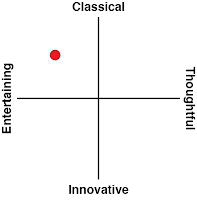 That game had only 3 levels, 8 different types of towers, and I could play it over and over without getting bored. Bloons TD 5 makes the mistake of equating content with value, and assumes that as long as the player feels like they’re doing something, they’ll keep paying actual money to do things more efficiently. If NinjaKiwi had decided to release the first 5 TD games as an anthology, like the Switch’s MegaMan collection, I would have gladly paid the asking price and only played the first 3 games (also like the MegaMan collection). But instead, the team has taken the 5th title in the series – a game which was pushed to the internet in 2011 to cash in on the microtransaction market - took the microtransactions out, and masqueraded it as a proper title in the Switch eShop. 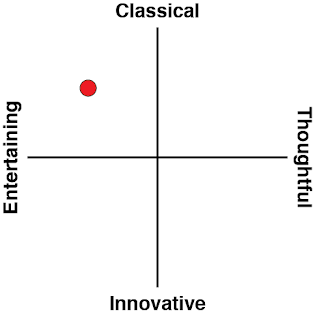 That would’ve been enough to justify a 1/5 score – it’s nothing but a Skinner Box, but at least it’s functional. Things get even worse though. The original Bloons TD 5 still exists in a freemium Flash version on NinjaKiwi’s site, and it’s so cluttered with paywall bonuses that it’s hard to find the play button. It’s on this site where you’ll be prompted to by NinjaCoins, an unsecure, unrefundable currency that can only be used for NinjaKiwi’s games, where you’re prompted to spend $200 real dollars for 2500 coins because that’s the “best value”. I guess the real best value is getting the Switch game for $20 rather than pay whatever it would have cost to unlock everything in the freemium game. As I played more of the Flash game for comparison, though, I realised something. Because I didn’t have immediate access to every tower, every upgrade, every map and dozens of free buffs, the freemium game was challenging. I had to think strategically on occasion. Bloons TD 5 on the Switch manages to be worse than the iteration released 7 years ago, for free – and that’s not even mentioning the poor control options on the Switch compared to the precision offered by a mouse and keyboard. The Switch even has a touch screen that the developers didn’t use, even though it ported Bloons TD 5 – with touch controls - to the iPad several years ago. It’s genuinely sad to see NinjaKiwi like this. I wonder if the studio’s founders realised that, ten years down the line, they’d have an international company gouging players for microtransaction money, and re-releasing empty husks of old games onto the Switch for the chance at even more revenue. The studio clearly has way more manpower than it did before, and its current IP is still successful – but rather than use those resources to create engaging or creative games, it has become no better than pickpockets. Bloons TD 5 is representative of a once-great studio at rock bottom. Let’s hope that the good folks at NinjaKiwi haven’t completely forgotten how to make a game fun, and either find a way to revitalise Bloons, or find a new game entirely, if the plan is to ever release another Nintendo Switch game again.